On the days when we look and look for leatherbacks at sea and come up empty, or those times when we miss catching the one (or more!) turtles we do see, I’m often oddly satisfied. It’s better, certainly, when we are able to do as much work as possible at sea. It’s incredibly frustrating and sometimes demoralizing when the days slip by and there is no leatherback to show for all of our effort. But there is something I like about the turtles evading us. There is something that makes me feel safe about nature out of our grasp—even when we are trying to help. We are transfixed by the patterns of positions that pop up over the hours her tag is transmitting. And we are puzzled. 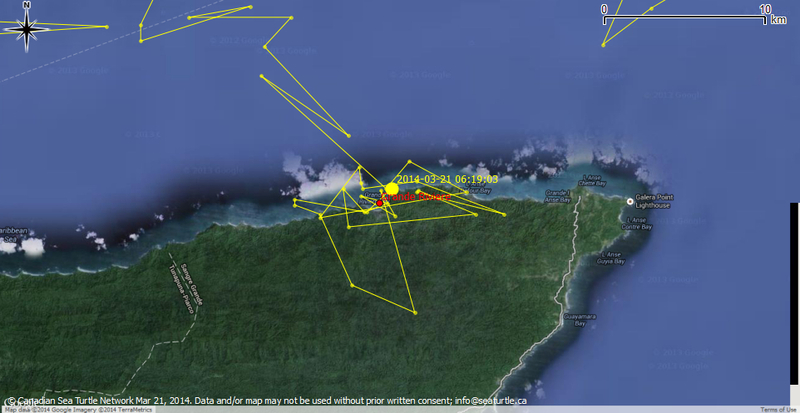 Other leatherbacks we have tracked zeroed in on their beach and nested directly after reaching the coast. They haven’t done what Margaret is doing. 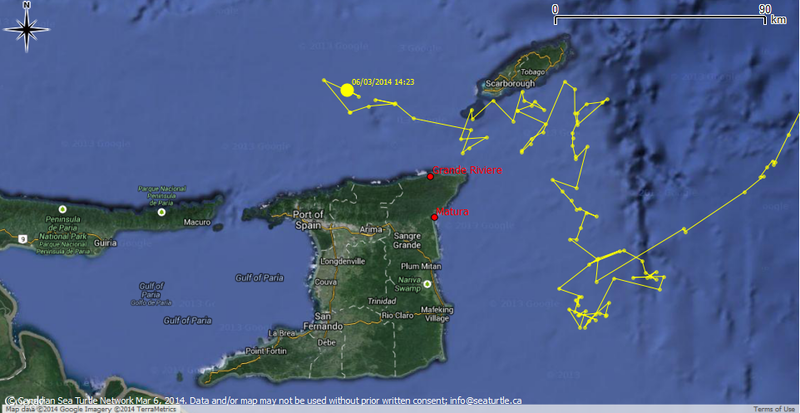 For three nights she has returned to nearshore waters directly off Grande Rivière beach; she may even have crawled out of the surf zone a few times, but we’re pretty sure she hasn’t nested yet. Margaret, no doubt, knows just what she’s doing. But we are unsure. Not in a worried way yet. But in a good, curious, what-on-earth-is-she-up-to-and-why way. I wish we knew exactly. It’s like an itch you can’t properly scratch. It’s that space where we realize that although we’ve learned a lot about leatherbacks over the last fifteen years of our work, there is still so much that is mysterious about them. There is still so much we discover as the hours pass. 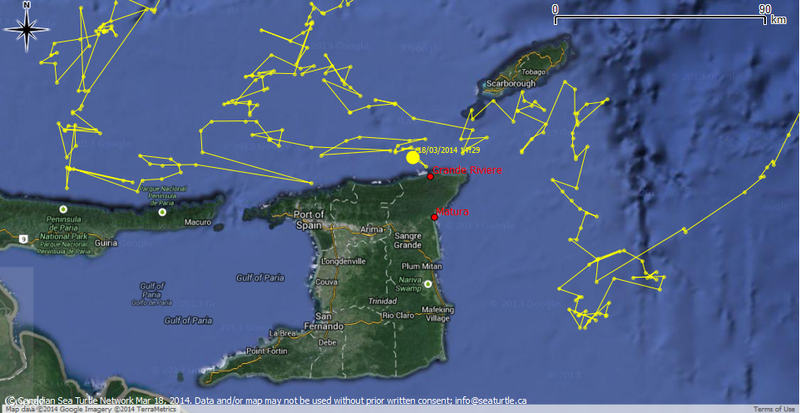 Maybe tonight Margaret’s return to Grande Rivière will finally culminate in a nest, or maybe she’ll keep us guessing. The team at Grande Riviere did not find Margaret last night. 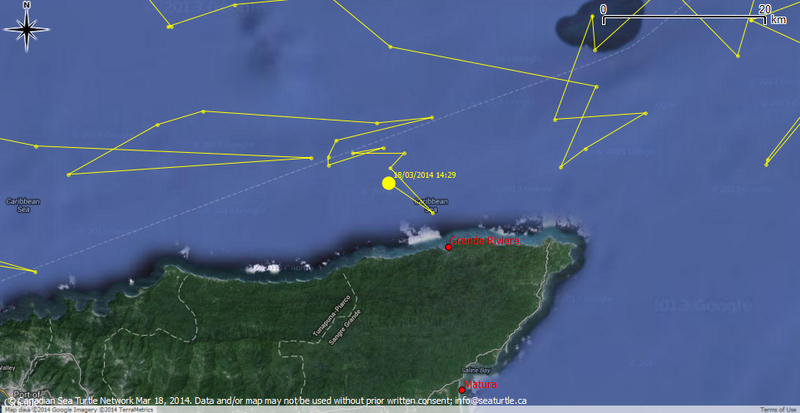 We have gotten new hits in the last hour from her tag showing her just 3 kilometres west of Grande Riviere beach. We’re still waiting to see what she’s going to do…and compulsively checking every few minutes for new data! 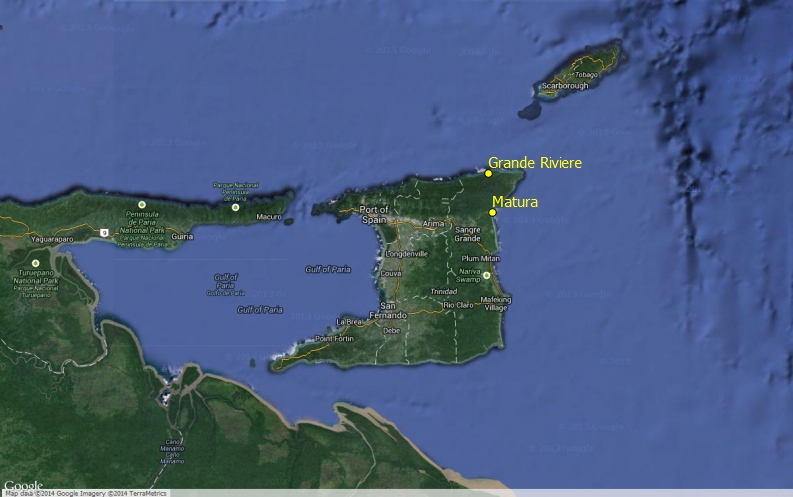 A few minutes ago we got a good-quality satellite hit from Margaret–she’s about 1.5 kilometres off the nesting beach at Grande Riviere! The team on the beach there is out in full force looking for her in case she nests tonight! Lots of excited calls and texts between the turtle teams in Canada and Trinidad. Stay tuned! Here is Margaret’s map from this morning. She’s not as close to shore as she was last night. She’s wandering a bit…pretty common leatherback behaviour. For fun, we’ve put together a “When and where will Margaret first nest?” poll. You can participate here. People who guess correctly will be entered into a draw for a CSTN hat. As of a few minutes ago, Margaret is approximately 20 kilometres from Grande Riviere beach and 40 kilometres from Matura beach. We’re really excited here. Scott arrives in Trinidad in a few days and our friends on the nesting beaches are on the alert. Maybe she’ll nest tonight. Or tomorrow. Or not. Leatherbacks are funny that way. In great news, Margaret’s tag is sending good locations again. I’ll post an updated map in the morning. 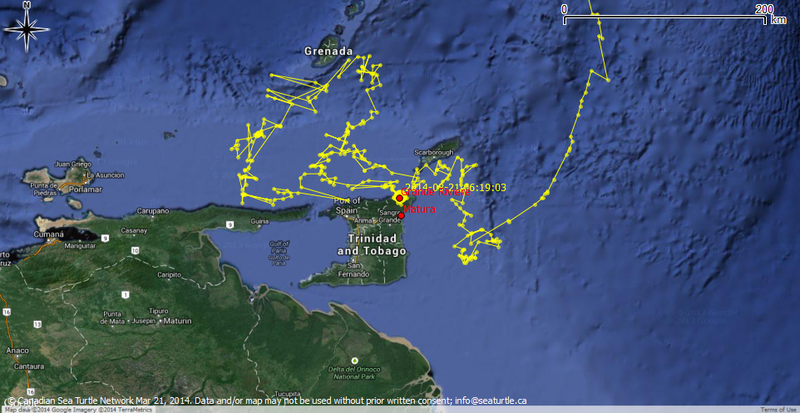 As of this morning, Margaret is only about 100 kilometres away from the Trinidad nesting beaches! That means in four days she travelled more than 250 kilometres south towards Trinidad. Mike, our turtle scientist, was talking to Scott Eckert last night. Scott is the director of science for the Wider Caribbean Sea Turtle Network, and he works with the Nature Seekers in Trinidad. He reminded us that it is early for nesting in Trinidad and it may still be a long while before Margaret comes ashore. Nonetheless, we are watching her movements carefully and keeping our friends on the beaches updated.